Henderson, NV actually started out as a very small town. 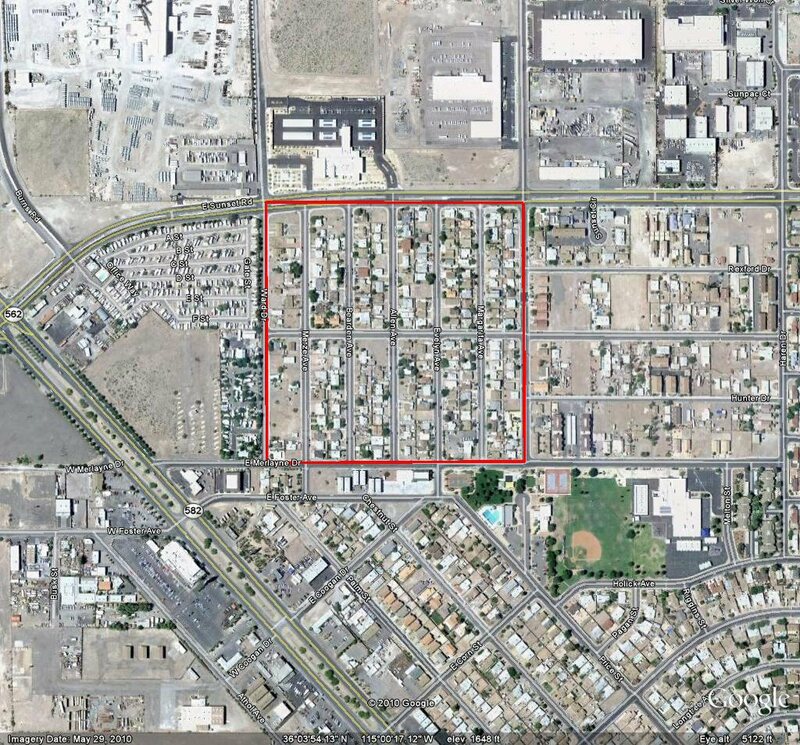 The original area that was Henderson can still be seen though with some of the original structures still in place. First off, when "Henderson" first started it was known as Jericho Heights. The first homes were built there in 1929 and two years later these homes were used to house some of the workers that built the Hoover (then Boulder) Dam. It was located Near Sunset Rd and Boulder Hwy. The actual boundaries are Sunset Road to the North, Moser Street to the East, Merlayne Street to the South and Ward Drive to the West (seen in red.) In 1932, it was renamed Midway City and at some time was also named Pittman as the town outgrew its original boundaries and spread east and west. This also happens to be the reason that Pittman wash, the main wash that runs through Henderson has that name. They both were named after a Governor of Nevada, Vail Pittman. In the area pictured, you can see some of the oldest houses still around. Bike riding through those streets brings back a feeling of the old west. A simpler time, where you could get shot in broad daylight for looking at someone sideways. Come to think of it, not much has changed in that area. Then in 1941 the Basic Magnesium Inc. (BMI) plant was built, about 6 years after Hoover Dam was completed. Due to the World War II, and the government's need to burn down Germany and Japan, magnesium was needed. So, working with Nevada Senator Pat McCarran, an Ohio businessman named Howard Eels convinced the federal government to help fund the building of a new magnesium production plant through Eels company, Basic Refractories. 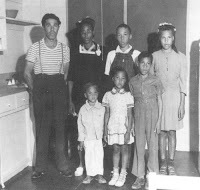 During the building of the plant and subsequent operation of the plant, the area attracted as many as 3000 workers, many of them southern folks and many of those were black. Here's the thing though, black people weren't allowed to stay in Midway City. They were segregated out to an area called Carver Park. 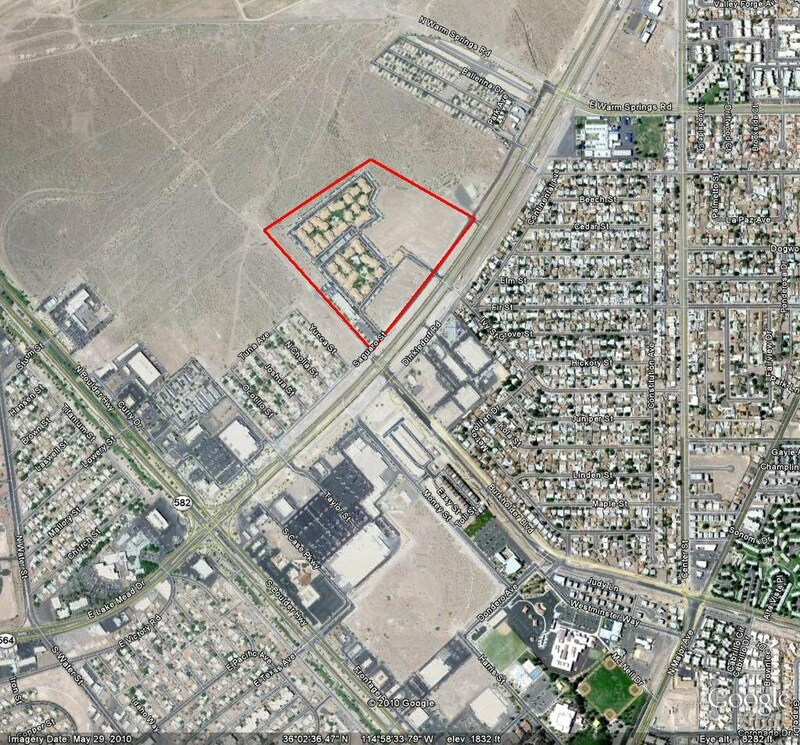 This area is near Boulder Hwy and Lake Mead. It has recently been redeveloped with new houses as you can see, but if you look at google earth's history view of the area, you can see the foundations of the old houses prior to redevelopment. Carver Park was designed by a very famous black architect named Paul Revere Williams, who not so incidentally went on to design the now defunct La Concha motel on the strip. and became known as Hollywood's "Architect to the Stars." Just across the street on the other corner of the intersection was Victory Villiage where many of the white workers lived in addition to midway city. Even though there was segregation in housing, all of the children attended the same school, Basic High School which at that that time was named Railroad Pass High School. Fortunately for everyone except BMI, the war was won and eventually ended in 1945. Magnesium was no longer needed in such high quantities and the plant was all but shut down. Many people moved away due to the lack of work and many things were tried to save the town. The War Asset Administration Office tried to sell the entire town as war surplus describing it as "a complete community establishment." Nobody was buying it. Eventually the Nevada government approved a sale to The Colorado River Commission of Nevada for $6 million. The Adrian Dominican Sisters purchased the city's first hospital, called BMI Hospital (as it was operated by the BMI corporation) and renamed it Rose De Lima. It is still in it's original location and is still operated by the same religious organisation under the name St. Rose Dominican Hospital. After the hospital opened, more people were attracted to the area. Through a government program, people were allowed to purchase the homes that were originally built by BMI as worker housing. Little by little, people started to return to the area and in 1951 the Henderson Home News weekly appeared as it's first newspaper. Soon the old BMI property was purchased by... BMI. 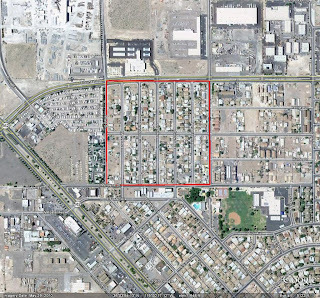 After the war, the property and factory reverted to the government and was no longer operated by Basic Magnesium Inc. but the Nevada Legislature formed an independent company called Basic Management Incorporated (BMI) to run the old site and manage the town. They still exist today and still manage the old site. They also own a company called Landwell that is currently reclaiming and developing some of the old contaminated land left over around the plant. Many companies began leasing parts of the old BMI plant including Kerr McGee, Titanium Metals Corporation aka Timet Corporation, Chemstar Lime and Pioneer Chlor Alkali. In 1953 the city was renamed Henderson in honor of Senator Charles B. Henderson and incorporated to become an actual city encompassing all of the original areas of the town. Soon after, industry started booming. Henderson got it's first radio station, KBMI-AM 1400 one year after incorporation which featured talk, music and peronalities that were popular with the troops stationed at Nellis Air Force Base including Geno Jackson and Herman Schmerdly. As a interesting side note, the station went off the air for a few years in the 60's and right before the station lost it's licence for non operation, the owners resorted to hiring an audio engineer from Caesars Palace to fix some faulty equipment and get the station on the air. 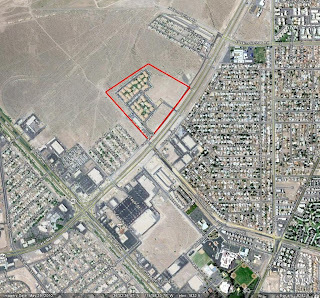 Henderson is now the second largest city in Nevada and it is still growing. Strange things happen here and the reason I researched much of this history is that it explains some of what we currently see. This all started with researching why Eastgate and Middlegate Roads are named that... Turns out that they were the roads that led to the east and middle gates of the old BMI plant. Great Stuff!!! Thank you to the Las Vegas Sun, Mark Hall-Patton (the director of the Clark County Museum), Mark Paris, CEO of the LandWell Corporation and the many interesting folks interviewed for this post. Sept of 1969. You failed to mention the TV station that was located on Boulder Highway in Pittman at that time: KVVU, Channel 5. (which is today a large TV station now located on Sunset Road)That little station was housed in a former gas station. I recall all the stained, concrete floors in tv studio as well as the main control room. Art Bledsoe managed the station. Nice man. The Rainbow Club and the El Darodo Casinos in Henderson were my favorite evening haunts. (69'-72') I received all my mail at the little post office located on Boulder Highway there in "Pittman", right across the highway from the TV station. Speaking of the BMI plant, I'll never forget the sweet/sour odor that plant emitted, especially during the hot, HOT early morning summer hours.